We put our ewe lambs with a ram in the fall. Most lamb as yearlings and we have found that Scotties of any age rarely require assistance as they have a very strong "mothering" instinct. 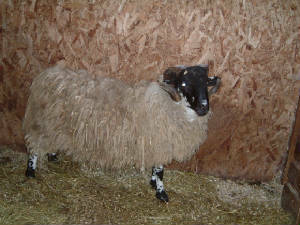 Shown above is Crannog 11P - This ram has sold. Other animals available. All foundation stock was DNA tested for Scrapie Resistance. All animals are also registered with Canadian Livestock Records Corporation. 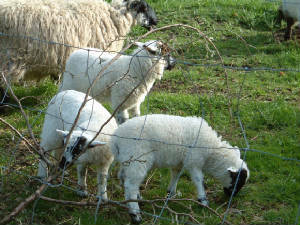 We can provide you with a starter flock - ram and 3 or 4 ewes - with pedigrees selected to allow genetic diversity. When you purchase a starter flock we will provide you with printed "test pedigrees" to clearly allow you to identify the breeding lines at a glance, with inbreeding percentages calculated. More photos to follow - overworked camera is gone for repairs!